MANILA, Philippines — Net inflows of foreign direct investments (FDI) tumbled by 38.2 percent to $609 million in January from $986 million in the same period last year amid the worsening trade war between the US and China which prompted jittery investors to withdraw their funds from the local equities market. 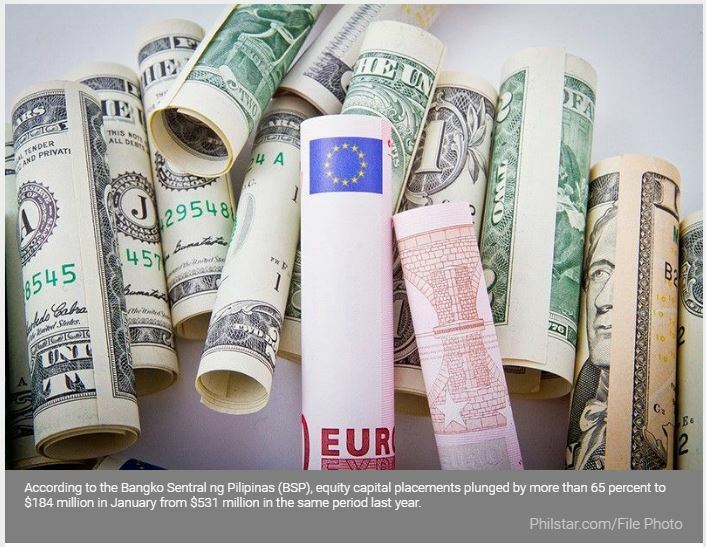 According to the Bangko Sentral ng Pilipinas (BSP), equity capital placements plunged by more than 65 percent to $184 million in January from $531 million in the same period� last year. At the same time, the pull out of funds from the Philippines reached $229 million in January or more than four times the $58 million withdrawn by investors in the same period last year. According to BSP data, investments in debt instruments surged by 31 percent to $577 million in January from $441 million, while reinvestment of earnings grew by� a paltry 6.6 percent to $76 million from $71 million. The BSP expects the 2019 net FDI inflows to reach $10.2 billion. Net FDI inflows declined by 4.4 percent to $9.8 billion last year from $10.3 billion in 2017, missing the BSP’s $10.4 billion target for 2018. BSP Governor Benjamin Diokno, however, remained optimistic, saying the rising FDI inflows over the past few years reflect strong interest from foreign investors. � “Probably around $10 billion or maybe higher, there’s a lot of interest in this country. The Philippines is probably going to be one of the fastest growing countries in this part of the world,” Diokno earlier said in a televised interview. Diokno said FDI inflows have increased to around $10 billion from only $2 billion over the past few years. “The rise of FDIs in recent years shows that investors have a lot of confidence in the Philippines,” Diokno said. BSP Deputy Governor Diwa Guinigundo said there was a big-ticket investment in a company in the electricity, gas, steam and airconditioning supply industry which came in tranches in 2017. � “If not for these inflows, 2018 net FDI would be higher than that in 2017,” Guinigundo said. The Duterte administration is looking at spending as much as P9 trillion for its massive infrastructure build up under the Build Build Build program. Investors remained concerned about the worsening trade tension between Washington and Beijing, while closely monitoring the actions of the BSP as inflation breached the two to four percent target of the government due to elevated oil and food prices as well as� the weaker peso. This prompted the central bank to lift rates by 175 basis points in five straight rate-setting meetings from May to November last year to prevent inflation from spiraling out of control. According to the BSP data, capital from Mauritius, South Korea, US, Singapore, and the Netherlands were infused into� financial and insurance, administrative and support services, real estate, electricity, gas, steam and air-conditioning supply as well as information and communication industries.